In 1961, Barnett and Stephens first coined the term “Ureterovascular hydronephrosis” for children with pelviureteric junction obstruction (PUJO) with crossing lower polar vessel (CLPV). They discredited the term “aberrant” for these vessels that they thought were normal lower polar segmental vessels with abnormal origin directly from the aorta. Preoperative knowledge of their presence may help keep the surgeon vigilant to avoid any iatrogenic injury, especially in the laparoscopic era. Color Doppler ultrasonography (US), helical computed tomography (CT) scan, and magnetic resonance angiography (MRA) have been used with success in detection of CLPV in children with PUJO. However, these investigations do not form part of the routine diagnostic workup of children with suspected PUJO. An attempt has been made here to identify clinical and imaging features which can act as pointers toward the presence of CLPV in children with PUJO. Retrospective records of children operated for PUJO over the past 10 years (January 2006–December 2015) were reviewed. Of these, records of children with presence of a CLPV (as a peroperative finding) were reviewed in detail including demographic profile, clinical and diagnostic workup, management, and outcome. Of the 372 children operated for PUJO, 21 (5.6%) had a CLPV. Median age at presentation was 7 years (range 4 months–11 years). The most common presenting complaint was abdominal pain (66.6%) followed by urinary tract infection (UTI) (14.3%), asymptomatic antenatally diagnosed fetal hydronephrosis (14.3%), and renal lump (4.8%). On US, majority (76.2%) had left-sided hydronephrosis. None had bilateral disease or dilated ureter. Subjectively, severity of hydronephrosis was mild in 10 (47.6%), moderate in 8 (38.1%), and severe in 3 (14.3%). There was no visualization of a crossing vessel in any of the ultrasonograms. On renal dynamic scan (RDS), all had hydronephrotic renal moieties with obstructive drainage pattern. Perfusion and function were preserved in majority, with 13 (61.9%) children having split renal function (SRF) >30%, 5 (23.8%) having SRF 10%–30%, and 3 (14.3%) having SRF <10%. Mean SRF of the affected kidney was 32.5% ± 15.65% [Figure 1]. Diagnosis of a CLPV was made intraoperatively in all. 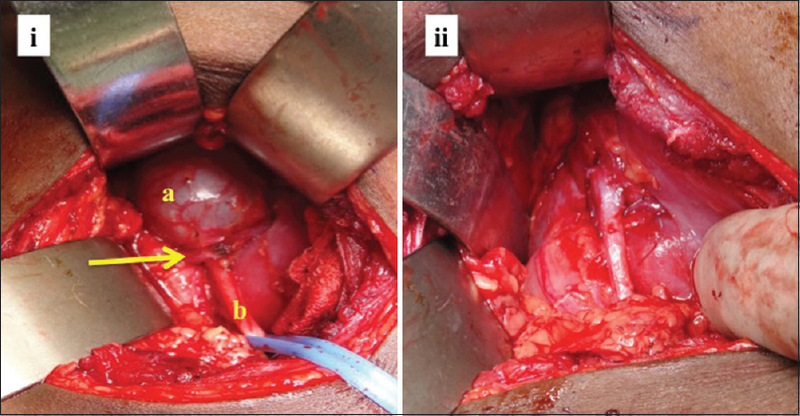 Dismembered pyeloplasty anterior to the vessel was done in the majority (80.9%) [Figure 2]. Three children underwent a side-side ureteropelvic anastomosis whereas nephrectomy was done in one child. Mean SRF on postoperative RDS improved to 36.6% ± 17.76% with a nonobstructive drainage pattern in all. All were asymptomatic at a mean follow-up of 34.5 ± 17.5 months (median 13 months; range 2–56 months). The presence of a CLPV in cases of PUJO has been reported, albeit largely in adult series, with an incidence of 11%–20%. This incidence was slightly higher than the present series (5.6%). Age at presentation in these cases is usually higher than other children with intrinsic cause of PUJO; mean age reported being 7.1 years. Menon et al. attributed the older age at presentation in these cases to the differential growth in the length of the aorta and that of the kidney with age. Diagnosis is rarely incidental (7%) with the majority of children presenting with features of renal colic (90%) or UTI (2%). In corroboration with literature, the current set of patients had a median age of 7 years at presentation with majority of the children (85%) being symptomatic with renal colic (66%), UTI (14%) and renal lump (5%). The intermittent nature of obstruction accounts for its delayed and less severe clinical presentation. Janetschek et al. looked for the presence of concomitant intrinsic stenosis as a cause of PUJO in children with CLPV by peroperative examination of the renal pelvis. They found the incidence of coexistent intrinsic obstruction to be 33%, suggesting that in almost two-thirds of the cases, a CLPV was the primary cause of the PUJO. The present retrospective study did not have sufficient records to identify the incidence of a concomitant intrinsic stenosis along with CLPV. In these cases of PUJO with a CLPV, US shows the presence of hydronephrosis without a dilated ureter, similar to what is seen in cases of PUJO with intrinsic obstruction. However, the presence of a small proximal dilated ureteral segment or resolution of hydronephrosis intermittently may provide subtle hints toward the presence of a CLPV. Kumar et al. retrospectively evaluated the US images of 20 children with PUJO and could correctly identify a CLPV preoperatively in only 1 of 8 children who were found to have a CLPV intraoperatively. This amounted to a sensitivity of routine gray-scale imaging to be merely 12.5%, specificity of 66.6%, positive predictive value of 20%, and negative predictive value of 53%. In the present series also, none of the US findings suggested the presence of a dilated upper ureteral segment or resolution of hydronephrosis during the asymptomatic period. Addition of Doppler imaging to routine US improves detectability of a CLPV. Chiarenza et al. demonstrated preoperatively the presence of crossing vessel in 80% children with PUJO. However, routine use of Doppler for imaging in children with suspected PUJO might not be warranted owing to the additional costs incurred and limited availability, especially in an Indian setting. Similarly, CT and MRA have been seen to have very high sensitivity and specificity indices in determining crossing vessels. However, even if diagnosed, none of these modalities can assert with certainty whether they are the sole cause of obstruction at the PUJ or are merely incidental findings. Whether their use has any impact on management or outcome is still debatable. Diuretic renography has been seen to demonstrate an obstructive drainage pattern during the intermittent acute episode. However, in the present series, an obstructive drainage across the PUJ was shown in all patients even when they were asymptomatic and pain free at the time of the procedure. This may be explained by the fact that even in the presence of a CLPV, the obstruction may actually be a result of an intrinsic defect at the PUJ rather than extrinsic compression per se. Another peculiar feature of these children of PUJO with CLPV is the relatively well-preserved differential renal function. In the series by Rigas et al. containing 71 children of PUJO with CLPV, only 11 (15%) had Differential renal function (DF) <40% and 2 with DF <10%. In the present series also, mean preoperative DF was 32.5% with the majority (61.9%) having DF >30%. Conversely, Menon et al. observed differential renal function on RDS scan below 40% in 56.6% of their patients. They attributed reduced renal function to the effect of the obstruction on renal parenchyma and highlighted the importance of early detection. However, postoperative improvement in function by >5% was seen in 46.4% of these cases. Menon et al. predicted with success the presence of a CLPV in children with PUJO using an intravenous urogram. A small, intrarenal, globular pelvis with a “flat bottom” and prominent calyceal dilatation was present in a significantly higher number of children with CLPV than in children with PUJO without CLPV. They prospectively predicted the presence of a CLPV using these findings in another 5 patients. Management is essentially the same as for any cause of PUJO, most commonly performed procedure being the dismembered pyeloplasty. However, preoperative knowledge of its presence may make the surgeon more vigilant and avoid any iatrogenic trauma. Another procedure described specifically for these cases is the Hellstrom's vascular hitch, wherein the periadventitial tissue around the vessel is pexed to the pelvis at a higher location away from the PUJ. This helps relieve any extrinsic compression caused by the vessel. This procedure does not require any breach of the urological continuity, does not require any drainage, and can be performed quickly, both open and laparoscopically. However, inherent in the technique is the fact that any concomitant intrinsic stenosis is not taken care of. Hence, in such children, symptoms will be persistent postoperatively and will eventually need a formal pyeloplasty for cure. Schneider et al. classified anatomically three types of CLPV by intraoperative location of the crossing vessel over the pelvis (Type 1), PUJ (Type 2), and upper ureter (Type 3). They advocated standard pyeloplasty for types 1 and 2 and nondismembered techniques such as Hellstrom's vascular hitch for type 3, which they assumed to be a purely extrinsic obstruction. Majority of children with PUJO and CLPV present late in life. Despite older age at presentation, renal function is well preserved. Preoperative knowledge of the presence of a CLPV may help keep the surgeon vigilant to avoid any iatrogenic injury. Routine US and RDS are unable to detect with certainty, the presence of a CLPV. Mild hydronephrosis with an intrarenal pelvis and a well-preserved renal function on RDS may provide subtle hints toward the presence of a CLPV. Routine Doppler or magnetic resonance imaging may not be warranted in these cases, as the incidence of a crossing vessel with PUJO is very low and management essentially similar to those with PUJO without a crossing vessel. Barnett JS, Stephens FD. The role of the lower segmental vessel in the aetiology of hydronephrosis. ANZ J Surg 1961;31:201-203. Assem A, Hashad MM, Badawy H. Retroperitonoscopic pyelopexy for pelviureteral junction obstruction with crossing vessel in adolescents: Hellstrom principle revisited. J Pediatr Urol 2013;9:415-8. Maheshwari R, Ansari MS, Mandhani A, Srivastava A, Kapoor R. Laparoscopic pyeloplasty in pediatric patients: The SGPGI experience. Indian J Urol 2010;26:36-40. Menon P, Rao KL, Sodhi KS, Bhattacharya A, Saxena AK, Mittal BR. Hydronephrosis: Comparison of extrinsic vessel versus intrinsic ureteropelvic junction obstruction groups and a plea against the vascular hitch procedure. J Pediatr Urol 2015;11:80.e1-6. El-Nahas AR, Abou-El-Ghar M, Shoma AM, Eraky I, El-Kenawy MR, El-Kappany H, et al. Role of multiphasic helical computed tomography in planning surgical treatment for pelvi-ureteric junction obstruction. BJU Int 2004;94:582-7. Janetschek G, Peschel R, Frauscher F. Laparoscopic pyeloplasty. Urol Clin North Am 2000;27:695-704. Kumar GK, Chapman S, Chandran H. An audit of routine grey scale sonograghic imaging for pelviureteric junction obstruction: Do they identify lower polar vessels? Afr J Paediatr Surg 2010;7:14-5. Chiarenza SF, Bleve C, Fasoli L, Battaglino F, Bucci V, Novek S, et al. Ureteropelvic junction obstruction in children by polar vessels. Is laparoscopic vascular hitching procedure a good solution? Single center experience on 35 consecutive patients. J Pediatr Surg 2016;51:310-4. Nerli RB, Jayanthi VR, Reddy M, Koura A. Pelvi-ureteric junction obstruction with crossing renal vessels: A case report of failed laparoscopic vascular hitch. J Pediatr Urol 2009;5:147-50. Rigas A, Karamanolakis D, Bogdanos I, Stefanidis A, Androulakakis PA. Pelvi-ureteric junction obstruction by crossing renal vessels: Clinical and imaging features. BJU Int 2003;92:101-3. Hellstrom J, Giertz G, Lindblom K. Pathogenesis and treatment of hydronephrosis. J Belge Urol 1951;20:1-6. Schneider A, Ferreira CG, Delay C, Lacreuse I, Moog R, Becmeur F, et al. Lower pole vessels in children with pelviureteric junction obstruction: Laparoscopic vascular hitch or dismembered pyeloplasty? J Pediatr Urol 2013;9:419-23.